This cooking skill is all about making croutons. Croutons are easy to make and are great served with salads and soups and can be eaten on their own as a snack. 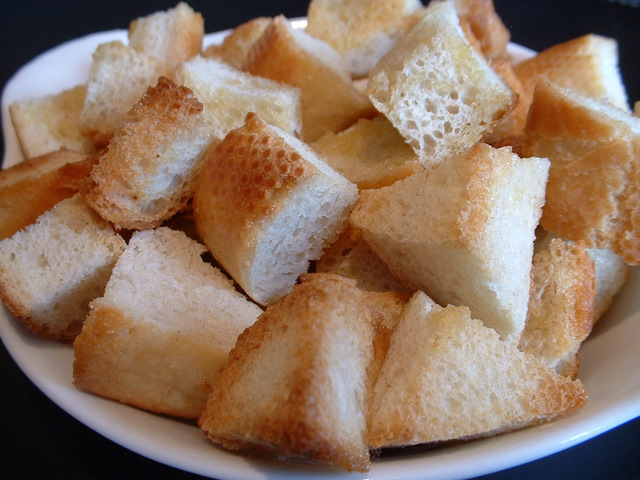 Croutons are mostly served as cubes but they can differ in size. Take a few slices of white bread. Cut off the crusts and cut the bread into small dice. Heat some vegetable oil in a frying pan, add the croutons and fry until golden brown. Remove with a slotted spoon onto kitchen paper to remove any excess oil. When cutting the croûtons, you could try rubbing the blade of the knife with a peeled clove of garlic after every cut. This will give the croûtons a subtle hint of garlic.